Digital advertising is crumbling and the Premium Web is taking its place. New digital subscription models are taking off because it is the best way to survive and thrive in a new digital ecosystem. This ecosystem is marked by declining ad revenue for traditional content producers. Facebook, Twitter, advertising middlemen and user ad exhaustion are eating away at the media’s traditional nest egg. 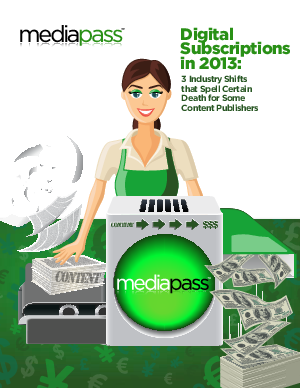 revenue and are building lasting media brands, supported by, and geared towards,customers. But those who fail to transform are under threat of losing their audience, revenues, and relevancy. In 2008, our typical internet user listened to music he downloaded from a file sharing network, rented his videos from Blockbuster or sometimes found a bootlegged file; he read blogs, magazines and newspapers on his laptop—allforfree. Ourinternetuser was happy; he had things for no cost that once cost dearly, even if the experience was not ideal. In 2013, our internet user streams and saves all the music he wants with his Spotify account, watches television on Hulu, and streams movies fromNetflix. He has a favorite radio station that he pays to download their podcasts. He has subscriptions to two newspapers, four magazines and one blog, which he reads at work on his screen, in his down time on his mobile phone, and on the couch with his iPad (and sometimes in print). Our internet user pays more than $100 a month for all this content, but hethinksthat’sfair. He has unparalleled choice and convenience – and belongs to ecosystems that offer a premium experience.